Today is my first real day off in in about a week as I’ve been rehearsing and performing almost constantly. From our second day in Amsterdam (Wednesday), I began rehearsing with Gregor Schaefer (bass) and Erica Roozendaal (accordion) for the concert at the Portuguese Synagogue. On Thursday, we performed for over 200 wonderfully appreciative audience members. Gregor and Erica were in great form as we played our way through about a hundred years’ worth of European klezmer repertoire. Starting with songs collected by Moshe Beregovski, we continued to perform music recorded by Belf (and his imitators) while also performing “neo-traditional” compositions by European musicians like Gregor and Christian Dawid. We also selected repertoire from the Moldovan clarinetist German Goldenshteyn who immigrated to the US in the early 1990s and passed away in 2006. 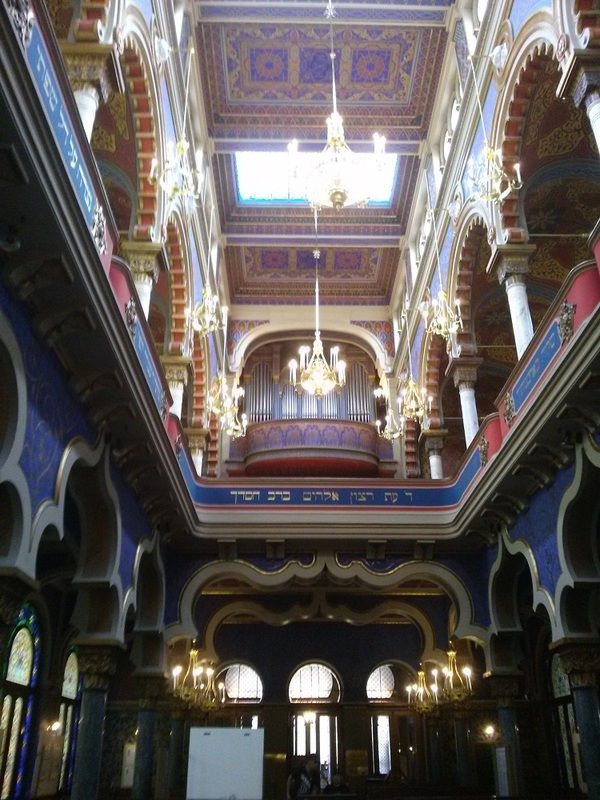 Playing in the Portuguese Synagogue, one of the oldest, still-in-use shuls in Europe, was amazing. The acoustics allowed people to hear every sound and the band could fill the space easily. The audience was fantastic and we literally had to perform one of our pieces encore to give them just a little bit more music before they went out into the beautiful Amsterdam weather. For me, it was terrific, not only to play with Gregor and Erika but also to see old friends like Bert Vos and Lucia Boeken. We stayed in Amsterdam with another old friend, Aleksandra Markovic whose hospitality and warmth was second to none. Unfortunately, there was no rest for us as we boarded a flight to Prague on Friday morning. Arriving at Vaclav Havel International Airport just after noon, we claimed our baggage and boarded a bus and then the metro to take us to rehearse with Lenka Lichtenberg. The “Lullabies from Exile” European CD Release concert brought Lenka together with a fantastic group of musicians that I was honoured to be a part of. The “Lullabies” project brought Lenka together with Israeli oud and violin player and singer Yair Dalal to blend lullabies from their different traditions. The Yiddish, Hebrew, Judeo-Arabic, Czech and English songs were fused seamlessly to highlight both musicians’ distinct talents. Eminent accordionist and pianist Alan Bern took a time out from his hectic schedule as the head of the Yiddish Summer Weimar program to join the band. David Doruzka, an outstanding jazz guitarist and Tomas Reindl, a phenomenally versatile percussionist (and didgeridoo player) were also mainstays from the concert and the CD. Paromita danced at our first concert in Decin at the beautiful synagogue there. The concerts also featured the debut of one of my new compositions for KlezFactor: Europa. This tune, “Cosmo Alex,” is a blend of klezmer melodies with Arabic rhythms and Balkan inflections, giving it a cosmopolitan flair typical of KlezFactor’s music. The performance in Decin also featured Paromita’s dancing. After three concerts in four days, I’ve got some time to work on more music for KlezFactor while also preparing to write my paper for the conference in Kazakhstan in about 2 1/2 weeks. Coming up on Wednesday is our flight to hitherto uncharted territory (in both of our previous travels): Istanbul. There’s just over two weeks left to contribute to the Indiegogo Campaign for KlezFactor: Europa! Our tour and recording dates are coming up fast and we’ll be in Berlin on July 28, Dresden on July 29 and Prague on July 31!